So we’re, uh, pretty sure that Bell’s behind those mystery “er” ads after all. A poster at RedFlagDeals leaked some second-phase ads yesterday—including one for the Samsung Instinct that proclaims it an “apple eater”—which have since been confirmed by a few Torontoist readers as the real deal. The second phase is being revealed all around the city now (one revealed one is near where the Don Valley Parkway and Gardiner Expressway meet; others are in GO trains). 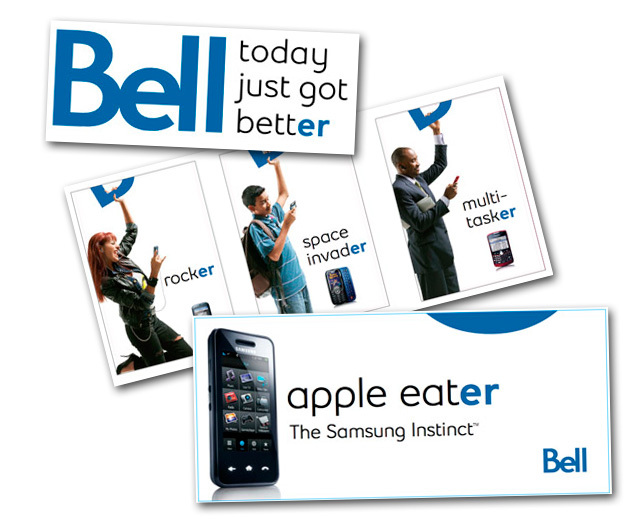 Just a few hours ago, Bell issued a press release about its “much-anticipated new corporate brand” and claimed ownership of the “er” ads; the ads’ blue shapes—”Bell-ements”—were all parts of the new Bell logo. Silly us, thinking that the ads might be Olympics-related, or otherwise remotely interesting! Thanks to Jason Wager and Jen for the tips.